After securing her place in the general election for Representative of the 8th CD, the Democratic Congressional Campaign Committee (DCCC) has added Dr. Kim Schrier to their “Red to Blue” program. DCCC Chairmen Ben Ray Luján made the announcement Thursday morning. The Red to Blue program supports Democratic candidates for the US House in competitive races currently held by Republicans. The program offers fundraising support along with guidance, resources, candidate trainings, and organizational support. The program currently includes 73 candidates from around the nation. Schrier joins Democratic candidates Lisa Brown (5th CD) and Carolyn Long (3rd CD) in the Red to Blue program. The DCCC added Long on August 10th and added Brown back in February. The only Washington Democrat running in a red district for the US House that is not included on the list is Christine Brown, who is trailing 27 points behind Rep. Dan Newhouse in the 4th CD. “As a mom and pediatrician, Dr. Kim Schrier has spent the last two decades caring for the families of Washington’s Eighth District, and she will continue to do so in Congress. Dr. Schrier’s personal story and strong campaign put her in an excellent position to win this open seat come November,” said DCCC Chairman Ben Ray Luján in a press release. Schrier will face off against Republican Dino Rossi who garnered 43.14 percent of the vote in the primary election. 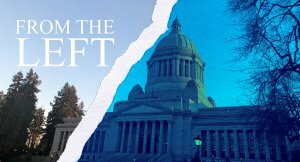 Schrier received 18.74 percent, but split Democratic voters with Jason Rittereiser (18.05%) and Shannon Hader (12.55%). The race should be tight in November.